Although it is the first feature film directed by Oz Perkins (son of Anthony), THE BLACKCOAT’S DAUGHTER is his second to see release. I AM THE PRETTY THING THAT LIVES IN THE HOUSE was released last year by Netflix, and was one of this critic’s favorite films of the year. 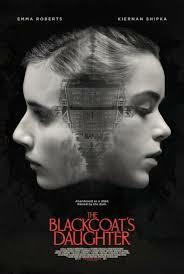 Despite having sat on a shelf for a while, THE BLACKCOAT’S DAUGHTER is almost as good. Perkins takes a familiar horror film setup – a private girl’s school oozing with barely contained sexuality and beset by evil – and puts a fresh and satisfyingly creepy spin on it. With most of the students going home for break, Kat (Kiernan Shipka) remains, waiting for her parents to arrive and fearing that they won’t. The only other student on campus is Rose (Lucy Boynton), who has lied to her parents about when they should pick her up because she needs to deal with her unexpected pregnancy. To her Chagrin, Rose is charged with looking out for Kat, a duty she doesn’t take very seriously. As it turns out, though, things will become very serious indeed for both students, culminating in horror, madness, and perhaps demonic possession and an exorcism. This is a somewhat more visceral horror film than I AM THE PRETTY THING THAT LIVES IN THE HOUSE, with more action and violence, and a more disturbing subtext, as well. But as with his follow-up film, Perkins is dealing with subtle, serious themes involving fragile psyches. But the core idea in the film is the notion that loneliness itself can be so horrifying that having a murderous entity live inside of one is preferable to no company at all. 3 ½ out of 4 stars.